So after a few weeks away in Canada on holiday, I'm back and raring to go with orders to catch up on, and copious amounts of laundry to do, ugh. 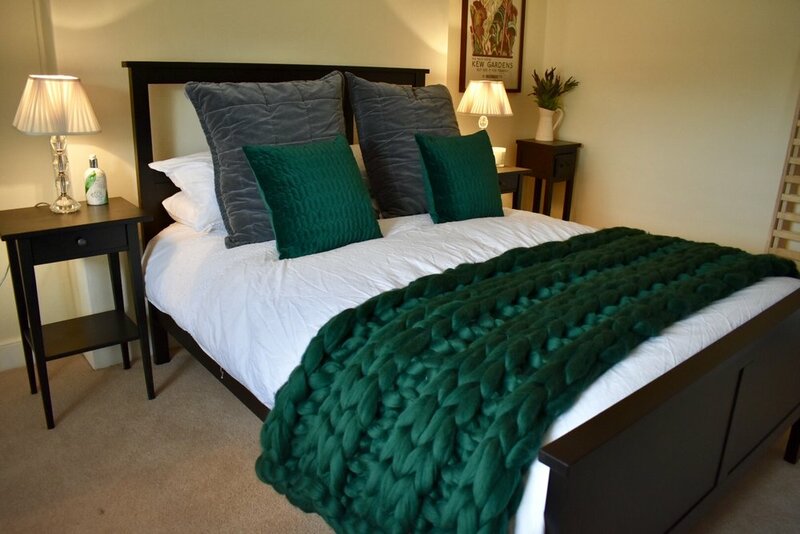 Before I left however, Muddy Stilettos Gloucestershire & Wiltshire did a blog article on us and how to style your chunky knit blanket or throw. Here is the article in full. You must check out Muddy if you haven't yet. Courtney, aka The Chunky Needle, is our new interior design guru. Yes she is, for when we visited her Georgian home in Newnham-on-Severn, everywhere we looked we fell in love with her style – and it was the huggable chunky-knit blankets, throws and cushions she makes that were stealing the show (although we did also rather fall in love with her 1950s drinks trolley). Her gorgeous home looked like it had been styled for a magazine shoot – and she’s got twin toddler boys!! How does she do it?? We pinned her down and went room to room picking her brains for tips. Texture is everything and with the trend for bringing the natural world indoors in the shape of driftwood, pinecones, shells and antlers, this is the room to go big on contrast. If you have wooden floorboards, a sheepskin rug will instantly add Alpine style and cosiness, while velvet will adds a touch of opulence – you can go the whole hog and cover an entire sofa or just add notes with cushions. Throws are great on leather sofas, as again they create a texture contrast. A brightly coloured merino on the back of a sofa or armchair will make the room feel warm and comforting. And they’re quite handy on chilly nights too! It’s an easy way to give your sitting room a seasonal upgrade – swapping the patterns, colours and textures of throws and cushions is far less hassle and money than a new wallpaper or paint job! While you can neatly fold blankets and throws over furniture, draping creates the image of a lived-in room, that elusive hygge look. It might take a few attempts to get the designer feel, but keep throwing, it’ll come! Family-friendly benches are great for getting lots of little ones settled at the table, but they can be a bit rigid to look at and hard for small bottoms to sit on (and big ones come to that). A chunky knit throw softens both the look and the feel, adding a nice cosy touch to mealtimes. You could even let kids choose their own mini throw in their favourite colour which they can drape over a seat and mark their territory. Workrooms, reading corners and dens are perfect places to integrate a chunky knit or cushion. Lap blankets will just make you want to cosy up with a cup of tea and read a book or get creative. They’re great for kids’ reading corners, too, encouraging quiet time, phew! Throws in the bedroom add instant luxury and warmth. A blanket can either be neatly folded as a runner at the base of your bed or draped to create a just-got-out-of-bed feel. Mix up faux fur throws, velvet cushions, sheepskin rugs and chunky merino blankets to create an inviting, sumptuous feel. And don’t worry about size. I have a super king-sized bed but draping means I don’t need super king-sized throws which can be pricey. It’s all about layering. And, as in the sitting room, you can change the mood with the seasons, swapping heavy knits for linens and chenilles. My tip always though – keep things looking a bit messy as folding can become too bulky. A folded blanket in the hallway is a great way to soften a shelf, introduce a pop of colour and make a feature out of storage space. They’re also handy on chilly evenings or for impromptu picnics as you head out the door. As the weather starts to get warmer (ed – you listening weather, that’s what you’re supposed to be doing! ), the garden becomes an outside room to enjoy on long summer evenings, but with the British weather as it is, you may just need a blanket to hand! Bright colours look great on alfresco sofas next to the fire pit as the sun goes down and they’re also the perfect shawl to team with a floaty maxi dress!